Simply yoga - a blend of restorative and active yoga that's appropriate for all ages and abilities. 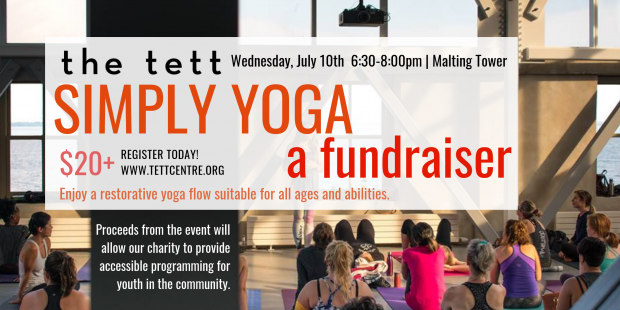 The Tett Centre for Creativity & Learning and local yoga instructor Isaiah Klassen are proud to present Simply Yoga our second fundraising event on Tuesday, July 10th! Proceeds from the event will allow our charity to provide accessible programming for youth in the community. We are proud to announce, After-School Makers, a new free teen program launching September 2019. Enjoy a refreshing and revitalizing yoga class in the Malting Tower, surrounded by breathtaking Lake Ontario views. Roll out your mat, take a deep breath, and move through a restorative and active yoga session, appropriate for all ages and ability levels. Please bring a yoga mat. Feel free to also pack a supportive cushioning, bolster, water, a sweater, or blanket (optional). Pre-registration required. Limited spots, register early and save your spot today! Isaiah is an established Kingston yoga teacher whose goal is to facilitate growth through a yoga practice sensitive to each student. Teaching at the previously donation-based studio 330 informed his commitment to safe space and straight-forward language. He believes everybody and every body can connect form and function for a better life. Isaiah studied postural adjustments in NYC and am currently certifying in Warriors at Ease, a program specifically designed for teaching students with PTSD. He has taught classes that ranged from restorative to power party, and experience with both small and large groups. To learn more visit: www.isaiahk.yoga. What community program are you supporting? After-School Makers is a new supportive studio environment where teens are encouraged and empowered to dream, explore, create, and thrive. Each Wednesday, makers are introduced to a variety of contemporary art projects and mediums with local professional artists at the Tett Centre. Working individually or collaboratively each session, makers are challenged to pursue their unique interests and goals. Our program is designed for teens, Grades 7-12, who are eager to refine their artistic skills, experiment with new mediums, discuss new ideas, and develop a well-rounded portfolio. Makers will also have the opportunity to focus on creating unique work that will be showcased at Tett Gallery this Fall. All materials provided. Light refreshments included. When: 3:30pm-5:30pm Wednesdays, September 18th – October 23nd, 2019. Grades 7-12. The program is FREE – please note space is limited. Pre-Registration is required. Registration opens this Summer.